This close-up ranges from the southern edge of the 'Starfish' decoy site, down through Hall Farm towards Sindlesham Road. Barrett's Lane and Carter's Hill Lane are the main feature, winding down through from upper right to lower left, where Monk's Cottage can just be seen. This lane emerges alongside Reading Room Cottage in Church Lane. At this time, Holloway's Lane ran from Carter's Hill Lane direct to Carter's Hill, but there is now no longer any trace of it. Click here to see Holloway's Lane, as marked on the Auction Sale Map for Carter's Hill Farm in 1919. The concrete track from Cockleberry Cottages on the corner between Barrett's Lane and Carter's Hill Lane, past the 'Starfish' site to the main Hall Farm buildings (off the left of this view) was the subject of a Rights of Way dispute in 1953, when the owners, by then the University of Reading, wanted to keep the access private. Luckily for us, the right of way was proven, thanks to the then Clerk of the Parish Council, Arthur Bentley - see the court proceedings by clicking here. 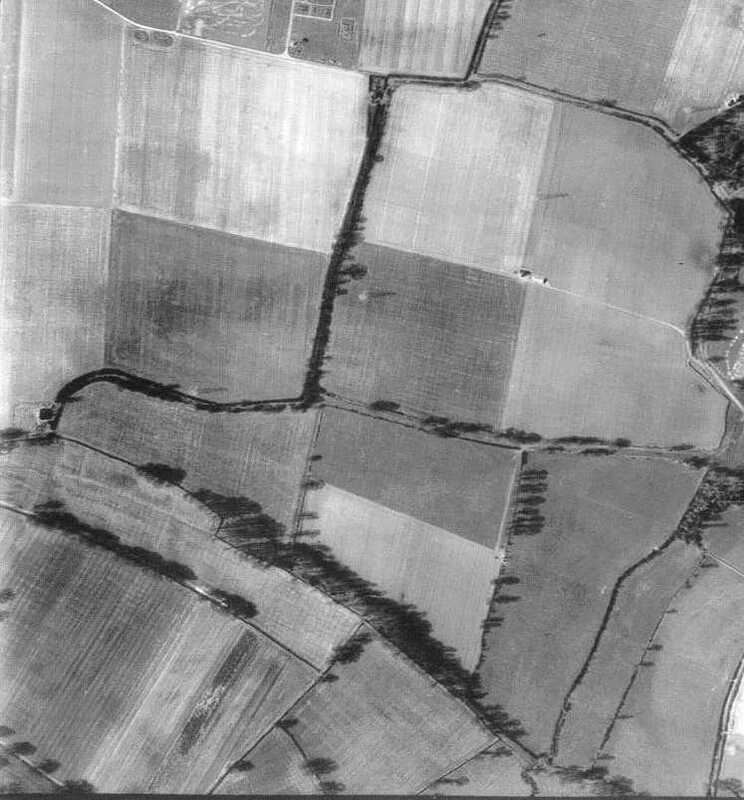 After the University of Reading had also acquired the fields of Carter's Hill Farm, to form part of its National History for Research in Dairying [N.I.R.D. ], it extended the main concrete track towards Julkes Lane - see a potted history of the N.I.R.D. by clicking here.